7.0" x 8.9" stitched on 14 count. 5.4" x 6.9" stitched on 18 count. 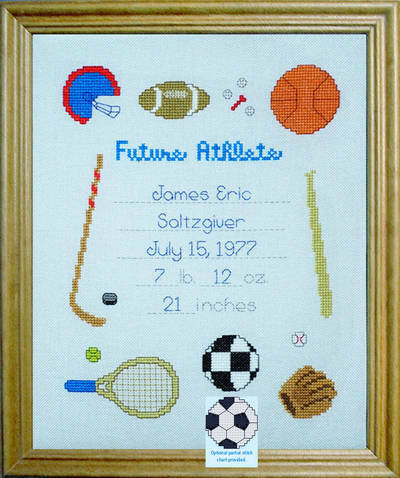 Future Athlete cross stitch pattern... This baby announcement design is for sports enthusiast fathers and / or mothers. Many sports are included. Personalization graph and instructions are enclosed. Graphs with partial stitches for more detailed alternative images are included.